The Rhinox Compact range of digging buckets has been designed and developed to meet the requirements of plant hire and groundwork companies. Here at Rhinox we understand that strength and durability are key features in the harsh construction environment. We have used hi-tech CAD design software to optimise these features whilst applying state of the art manufacturing techniques to keep costs as low as possible. As a company, we also recognise how important presentation is to machine dealers and manufacturers and pride ourselves on delivering a high-quality product in great condition every time. The Rhinox digging bucket ranges can be fitted with various options to suit specific working environments and applications. Where applicable, each product has a tick box to add these options to your order. 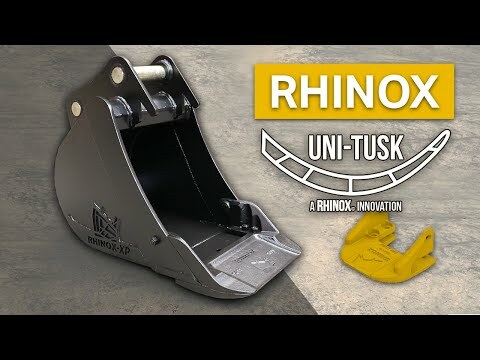 Rhinox buckets can also be fitted with a standard reversible cutting edge for situations where teeth cannot be used on the bucket. Where the bucket is being used with a manual quick hitch, the bucket can be fitted with dummy pins. All buckets above 5 tons come with dummy pins as standard. Do your bucket hangers look like this? Safelock SL10 Digging Bucket - 24"